YES! You’re on the right website! I know you’re used to seeing mostly sweet things around here, so when you saw this recipe for Sweet Potato Broccoli Chickpea Bowls, you may have gotten a little confused. 1. I have a sweet tooth and I love baking. 2. Because sweet things can be made and photographed in the morning, when I usually do my baking, and when the natural light is best. For a meal like this that we’d be eating at supper time, it’s a little tricky because I only shoot in natural light. By the time supper rolls around, the natural light slowly starts to fade which makes taking naturally lit photos a challenge…or impossible. But now that longer days have arrived and summer is right around the corner, I have a much bigger time frame to work with when it comes to food photography friendly lighting. So this means you will (hopefully) start seeing a few more savoury recipes here and there. But for those of you who love the sweet recipes, they aren’t going anywhere. So no need to worry. My husband calls these bowls “bowls of random stuff.” I call them Sweet Potato Broccoli Chickpea Bowls. Whatever you call them, they’re delicious. But really, he’s kinda right. 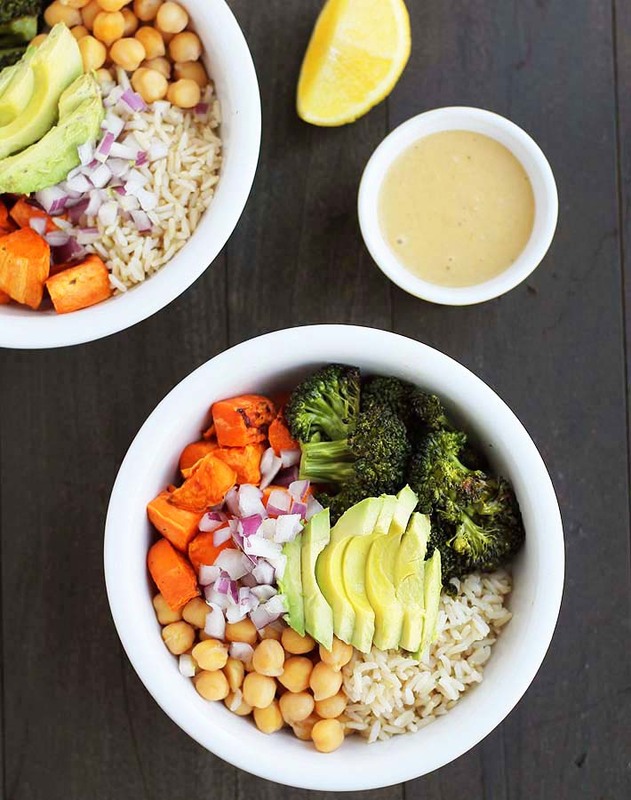 Because whatever you have in your cupboards or your fridge can be turned into a delicious meal in a bowl…or a buddha bowl, as some call them. This particular one is my favourite combination. Roasted sweet potatoes, broccoli, chickpeas, brown rice, a bit of diced raw red onion all topped with avocado and a garlicky tahini sauce. YUM. What I love about making these “bowls of random stuff” is that there are so many possibilities. The ingredients I’ve used here can be easily swapped out for others. When I make them, I always make sure I have something green, a vegetable that roasts up nicely, a protein, rice, and a combination of something fresh on top. I then top it all off with a quick homemade sauce. In this case, I made my garlic tahini sauce (my other go-to is an avocado garlic sauce, I’ll share that recipe another time). To add even more flavour, a squeeze of fresh lemon juice is nice. Then I mix it all up and devour. 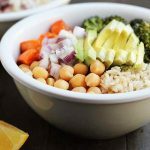 Sweet Potato Broccoli Chickpea Bowls can be enjoyed for lunch or supper. And don’t be afraid to try different ingredient combinations, there are so many possibilities! If you’re looking for a dessert to enjoy after you enjoy your bowl of deliciousness, you know I’ve got you covered in that department! And if you like this recipe, I think you’ll also like my vegetable fried rice with crispy ginger garlic tofu! 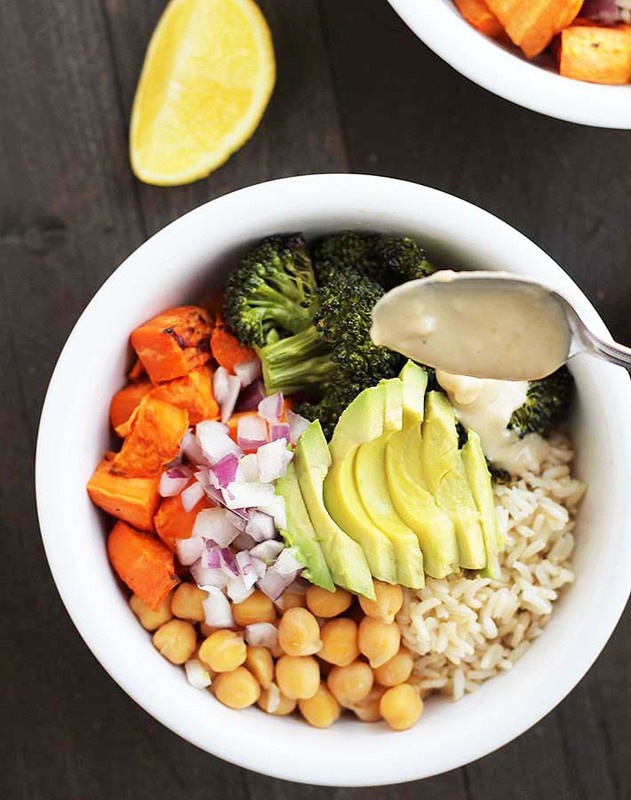 Throw together some nutritious ingredients and what you get are these easy, vegan Sweet Potato Broccoli Chickpea Bowls. Great for lunch or supper! Toss sweet potatoes with 1/2 of the olive oil. Place sweet potatoes on a parchment-lined baking sheet. After 15 minutes, toss broccoli with remaining olive oil and add to baking sheet. 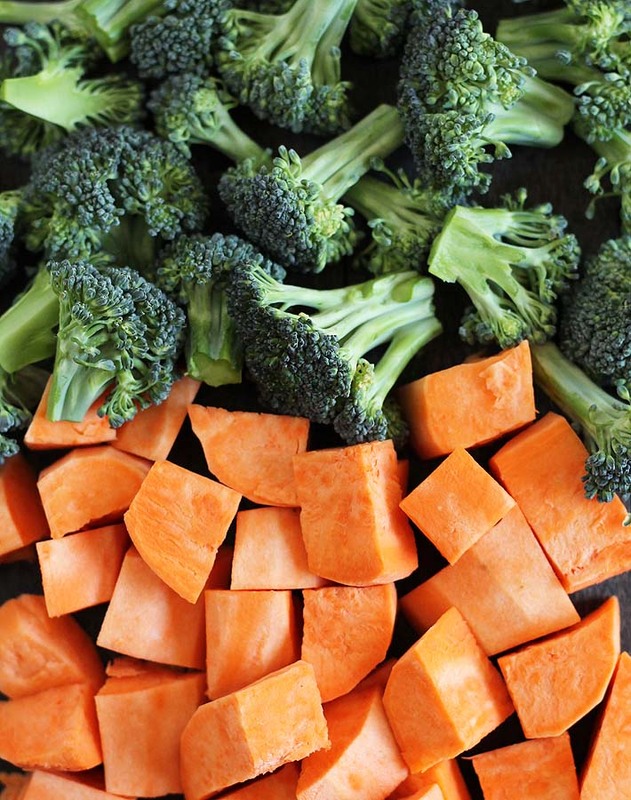 Bake broccoli with sweet potatoes for another 15 minutes OR until a fork can easily pass through the largest piece of sweet potato. Remove from oven, let cool for 10 minutes. Divide all ingredients into two bowls. Add tahini, pressed garlic, maple syrup, and lemon juice to a bowl and whisk until combined. Add hot water, starting with 2 tbsp, see note below. Once everything has been combined, add salt and pepper to taste. Squeeze the lemon wedges on top (if using). • This recipe makes 2 bowls, but if you want more, the recipe doubles nicely. If you want only 1 bowl, cut back on the ingredients by half. • Be sure that you use hot water when thinning out the tahini sauce (it can seize up and become very thick). Start with 2 tbsp and continue to add until you've reached the consistency you like (I usually stop at 3). • The maple syrup may seem strange to add to the garlic tahini sauce, but tahini can be a bit bitter on its own. The sweetness from the maple syrup cuts some of that bitterness out. 🙂 I hope you enjoy your bowl of random stuff, Jeroen! Let me know how it goes!